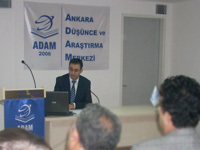 After briefing the audience on the recent developments in the world economy, Dr. Alpay evaluated the relative economic performance of the group of OIC member countries against other developing countries, developed countries as well as the world as a whole through an in-depth analysis of major economic indicators such as output growth, trade, investments, inflation and unemployment. As a part of his presentation, Dr. Alpay presented the key findings of the report titled “SWOT Outlook on OIC Member Countries”, the first study of its kind which was published by the Centre in 2011 for the purpose of raising awareness about the key strengths and the opportunities that the member countries have while turning the spotlight on the major weaknesses and threats they are facing. In this context, Dr. Alpay mentioned that having the youngest population is the most important strength of the OIC countries, as a group. On the other hand, he mentioned that high unemployment rate and lack of adequate funding for scientific development are among the major weaknesses that should be overcome by the member states. Overall, Dr. Alpay emphasised that the OIC countries, as a group, have a significant potential for enhancing their competitiveness both at the regional and international levels by identifying a fit between their strengths and upcoming opportunities. The presentation ended with an active Q&A session during which the participants were given the opportunity to raise a number of questions as well as share their reflections on the subject.